If O’Malley had set the bar to meet, Sanders has reached it. But does it matter politically? 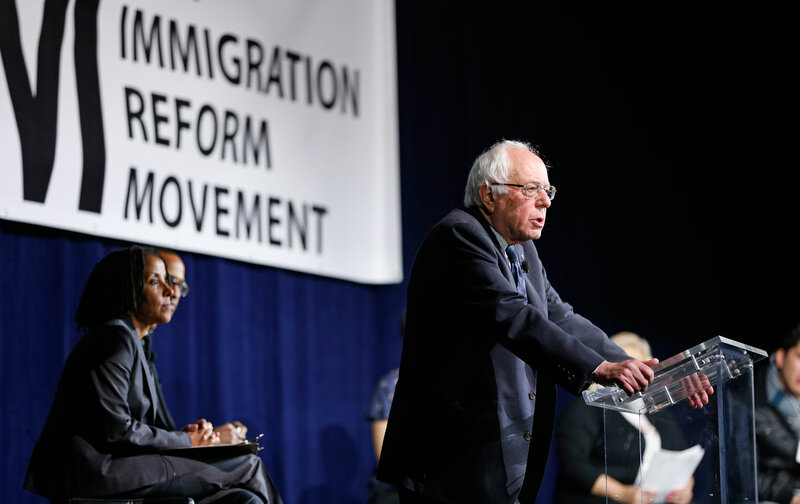 Last Tuesday Bernie Sanders announced a sweeping proposal for a “humane” immigration agenda, including a plan to temporarily shield as many as 9 million undocumented immigrants from deportation. The platform includes policy proposals for handling refugees (the vilified foreigners du jour) and a commitment to affirm and expand upon President Obama’s executive action for undocumented immigrants. With this robust platform, the Vermont senator is trying to accomplish two key tasks: woo immigrant and Latino voters who are crucial to any candidate’s presidential aspirations, and wash away any lingering concerns following his remarks this summer, when he opined about undocumented immigrants taking away jobs. The big question is: Will it work? In crafting this agenda, Sanders seems to be taking a few cues from former Maryland governor Martin O’Malley. Credit where credit’s due: O’Malley was for months the only presidential candidate to so clearly articulate a plan for taking apart the detention and deportation machine that has swept up more than two million people during President Obama’s time in office, and he was the first candidate to pledge to expand deferred action for “the greatest number possible” of immigrants. In remarks over recent weeks, Sanders had previewed the plan he announced Tuesday. He has pledged to extend Obama’s deferred action to all those who’ve been in the United States for five years and who are eligible for relief under the comprehensive immigration reform bill the Senate passed in 2013 (which died in the House). Such a move would benefit 9 million of an estimated 11 million undocumented immigrants currently in the country. Sanders also called out the much-criticized programs that enlist local law-enforcement agencies in the enforcement of federal immigration policy, and called for their end. He supports a law that would protect immigrant workers who report labor abuses and violations, and a policy that would curb detention of undocumented immigrants who are awaiting processing or deportation. If O’Malley’s plan has thus far been the high bar to beat when it comes to progressive, immigrant-friendly policy, Sanders certainly meets it. On the biggest issues—the extent to which either candidate would use their executive authority to institute short-term changes for immigrants; the degree to which either candidate believes local law enforcement ought to help the federal government enforce immigration law; and the proposed breadth of the detention and deportation system—Sanders and O’Malley see eye to eye. Both would expand executive action to include all those who would have qualified for the Senate’s 2013 immigration-reform bill. Both have promised to curb programs that ask local police to cooperate with the federal government’s enforcement of immigration violations. And both pledged to curtail the use of immigration detention. Where Sanders goes further than O’Malley is in details that affect segments of the undocumented immigrant population. For instance, Sanders proposes that “future legislation” concerning those undocumented immigrant youth known as DREAMers declare them “immediately…eligible” to serve in the military, receive federal financial aid, and become eligible for in-state tuition at a university, even if a state hasn’t passed its own in-state tuition bill for undocumented students. To the extent that both Sanders and O’Malley’s platforms satisfy an immigrant voter’s policy wish list, their policy ideas would meet a difficult political landscape when either candidate took office. For instance, executive action—which immigrant rights activists compelled President Obama to institute after Congress declined to pass reform—is a politically combustible tactic. Just over a year ago President Obama announced his second executive action concerning immigrants, Deferred Action for Parents of Americans and Legal Permanent Residents (DAPA), which gave the parents of US-citizen and green-card-holding children short-term protection from deportation. On November 20, on the one-year anniversary of that declaration, the Obama administration formally requested that the Supreme Court settle a legal battle challenging the program. Some 26 states, led by Texas, sued the federal government over the executive action, which would benefit an estimated 4 million undocumented immigrants. While immigration advocates are confident that the Supreme Court, which is widely expected to consider the case this term, will affirm the legality of the program, any plan to use executive authority to further expand the number of people exempted from deportation would certainly be met by a more complex landscape. But what about the more immediate political concern for Sanders: Will voters be sufficiently moved by his new immigration platform to pay attention to his candidacy, or be wooed away from other candidates? One challenge Sanders faces is his anonymity with Latino voters. Another is his stiffness with the issue. At campaign forums co-hosted by The Nation and the Fair Immigration Reform Movement in Las Vegas earlier this month, O’Malley was able to speak passionately about the importance of immigrant rights, and extemporaneously about immigration issues broadly. Sanders needed to rely on notes when it came to the immigration portion of his speech. (Clinton didn’t attend the forum.) To questions about executive action and enforcement, Sanders responded in short sentences, kept to the specific policy prescriptions, and had little in the way of follow up. On immigration, Sanders knew that he had to hit key talking points, but the issue just hasn’t come naturally to him, and it shows. It was only when a questioner asked Sanders about investment in jobs in communities like Detroit, which have been ravaged by the recession, that he left his stool and stood to give forceful remarks about the importance of economic investment in communities of color and a political revolution to upend the current economic order. Perhaps that will be enough. Sanders’s primary focus on economic issues, and his exhortations to build a political revolution—however vague—were reflected by his Latino supporters. The day before the campaign forum, Sanders spoke at a rally in the heavily Latino suburb of North Las Vegas, where several hundred gathered in the chilly (by Nevada autumn standards) evening to cheer him on. Robbie Alvarez, who went to the rally with his wife Veronica Torres, told me they turned out to show that, “You know what, Bernie Sanders is a major candidate in this election. We believe in him 125 percent.” They ticked off the issues that matter most to them: the economy, income inequality, climate change. “He’s had the track record, and he has stood up for people all of his life. You can’t say that for any other candidate,” Alvarez said. It was only when I prompted them for their opinions about immigration that Torres offered: “Of course the issue matters. You know, my dad’s an immigrant.” It’s only recently that her father has shared the stories of his earliest years in the United States as an immigrant from Mexico. He worked the fields in California and Arizona picking strawberries and lettuce, Torres said, and even though he’s a legal resident today, he is ineligible for Social Security. They’re outliers among their friends and family though, the rare couple who heads to political rallies in primary season for a candidate many have never heard of. But they’re undeterred. And they know whom they’ll be supporting at their party’s caucus in February.